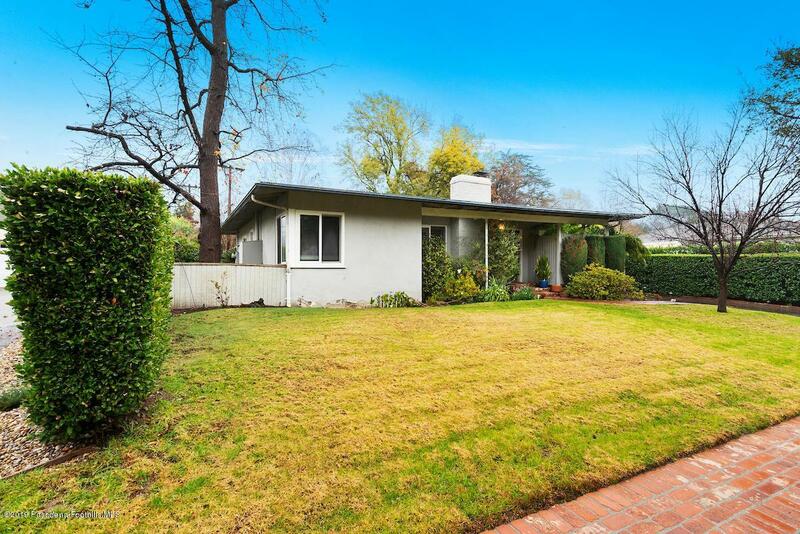 This charming 1946 Mid-Century Modern home with 3 bedrooms and 2 baths offers a great opportunity to live in the picturesque neighborhood of Paradise Canyon. Conveniently located by top-rated schools, this bright single-story boasts endless possibilities with potential to expand, an open floor plan, a large master with built-ins, great curb appeal from the beautiful landscaping in front and back and plenty of windows to let in all the natural sunlight. Some highlights of the home to include: full copper plumbing, central AC, newer 200 amp panel, new rain gutters and a newer water replaced in 2017. Most of the windows have been replaced with new Milgard dual pane. The home is in close proximity to all the downtown eateries and offers easy access to the freeway. This is an opportunity to live in the beautiful city La Canada Flintridge, all that remains are some cosmetic upgrades, and the new home owners personal touch.